Modern, inviting and imbued with a sense of serenity, Rambutan Villa is a three bedroom retreat made for a restful vacation. The villa’s beautifully landscaped grounds are made for lounging and relaxation - as are its finely appointed interiors. With kid-friendly amenities, babysitting services (available at additional cost) and impeccable hospitality, the villa is set up for sharing among friends or families with young children. 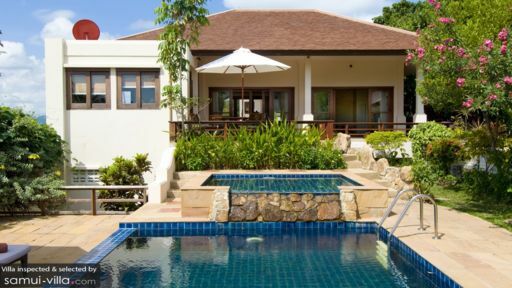 Each of the three bedrooms at Rambutan Villa looks out to the sparkling pool and beautifully manicured gardens. Similar to the common spaces, the décor is kept minimal with earthy hues and elegant wood furnishings. The master bedroom stands out with features like a double bed and indoor-outdoor en suite. Both guest bedrooms contain private en suites but offer different bed configurations; one of the rooms comes outfitted with a double bed while the other features twin singles. 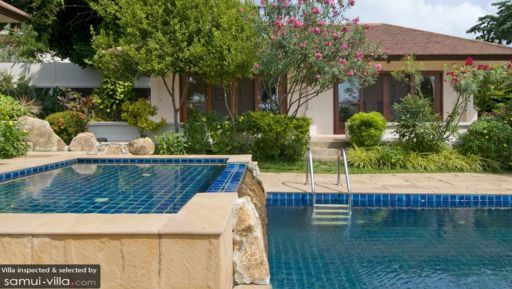 Rambutan Villa’s lush, sun-soaked compound offers ample spaces for outdoor relaxation. There’s the beautiful pool - which comprises of a plunge pool with waters cascading down like a waterfall into the main pool. Sun recliners set under patio umbrellas are a welcome addition, as are the well-manicured foliage surrounding the compound. A thatched roof sala outfitted with lounging chairs offers a comfy spot for shaded siestas. With its open plan, light-filled pavilions, Rambutan Villa is a holiday home built for tropical living. Cooling breezes flow through the common areas, made up of a lounge, dining area and kitchen. Natural wood and terracotta tiles are featured heavily in the décor, as are soothing earth-toned colours. A multi-channel satellite TV with DVD player offers entertainment, while Wi-Fi access throughout the property keeps you well connected with friends and family back home. The western kitchen, furnished with wooden cabinets and polished countertops comes equipped with a full range of cooking amenities. It opens out to a terrace furnished for al fresco dining. 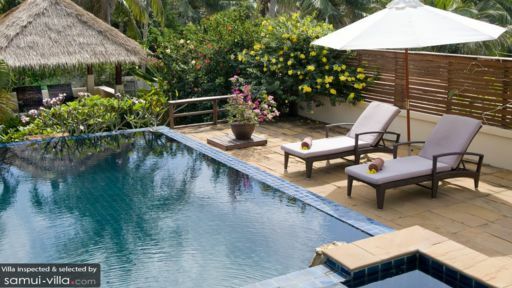 Vacationers will feel right at home immediately, thanks to Rambutan Villa’s immaculate and affable service. Airport pick-up, daily breakfasts, housekeeping, personal guest services, security service and welcome drinks are included with your stay. A baby cot is available at request. Available at additional cost are babysitting services, vehicle rental, in-villa chef services and in-villa massage treatments. Guests have access to the shared tennis court within the estate. Tennis rackets and balls are available for rental. With its picturesque white sand beaches and laidback vibes, Choeng Mon is a great bet for families. Choeng Mon Beach, a favourite hangout among expat families due to its shallow waters and lack of busy tourist crowds is just seven minutes’ drive away. You’re not limited to sunbathing, swimming or beach strolls here - there’s snorkeling, scuba diving and even snookah diving if you’re up for trying a new water sport. Jetskis and banana boats are available for hire. Away from the beach, there are yoga classes at The Yogarden Samui (15 minutes’ drive), Thai cooking classes at Island Organics (16 minutes’ drive) and top of the line spa rituals at Six Senses Samui (seven minutes’ drive). With high-end restaurants and casual eateries located around your villa, you’ll have ample choices for dining out. SALA Samui Restaurant and Pangaea offer beautiful interiors and a cosy ambience, while The Orchard Restaurant and Bar and Garland Samui are great options for relaxed, fuss-free evenings. Choeng Mon retains its tranquility well into the night, so the town doesn’t offer much in terms of nightlife options. If you’re after a vibrant beach party scene, hop into a car for a 16-minute ride to Chaweng Beach to soak up its lively ambience.